NM Josiah Stearman wins Sacramento City Championship with 2595 Performance! Home/Blog, News, Uncategorized/NM Josiah Stearman wins Sacramento City Championship with 2595 Performance! This year’s Sacramento City Championship had its strongest line-up ever, with one Grandmaster, two International Masters, and five National Masters! 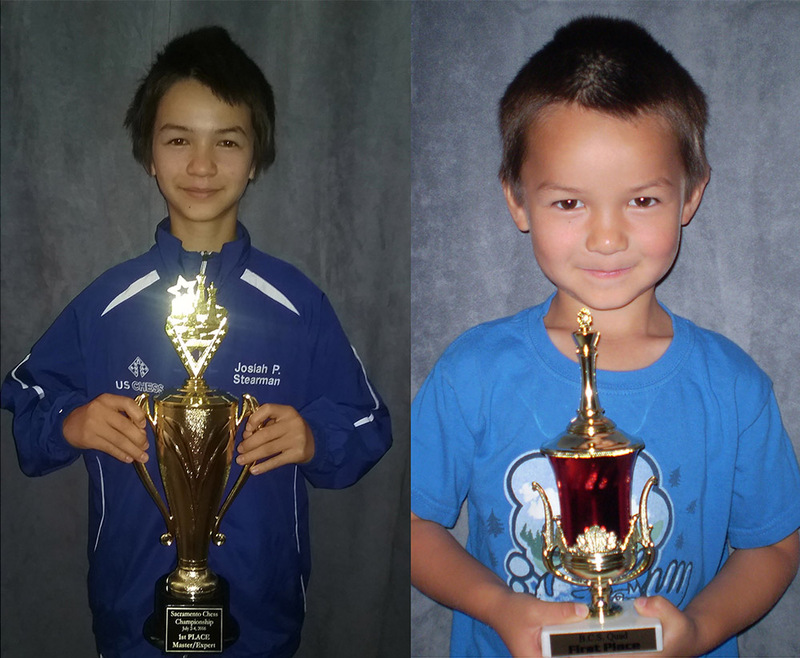 Berkeley Chess School sent two National Masters to compete: 2014 Sacramento Champion Bryon Doyle, and 12-year-old World Youth contender Josiah Stearman. Josiah played extraordinarily well, winning against both of his opponents on Saturday, starting with a perfect 2-0. On Sunday morning he beat Mongolian IM Ondondo Ganbold, then slowed down a little after that with two draws against NM Michael Aigner and IM Ricardo Deguzman. Going into the final round, Josiah was on board 1 against top seed GM Sevillano. The Grandmaster had 4.5, and Josiah only 4. Many players in this situation would be happy to draw the grandmaster, giving the GM first place and securing second for themselves. Not Josiah! He went all out for the win. Congratulations, Josiah, on a truly remarkable performance! The Berkeley Chess School is very proud of your achievement! Before and after: Josiah holding his trophy at the same spot where he held his first trophy from BCS when he was 5.